2005년 서울에서는 1일 11,170톤의 생활폐기물이 발생하였고, 64%는 산업용 대체원료나 유기성자원으로 재활용되고, 10%는 지역난방열을 회수하는 소각방식으로 처리되고, 나머지 26%는 수도권매립지에 매립방법으로 처분되었다. 시간이 갈수록 재활용과 소각이 늘고 매립이 줄어드는 방향으로 처리방법이 변화하는 추세이다. 대체자원으로서 폐기물의 활용과 안전한 처분은 그 시스템을 지탱하는 물류 및 설비를 요구하는데, 15개소의 공공재활용선별시설은 질 좋은 재활용품을 시장에 공급하고 있고 6개소의 음식물류폐기물공공처리시설은 음식폐기물로부터 사료나 퇴비를 생산하고 있다. 회수열의 활용이 용이하도록 4개소의 자원회수시설은 공동주택단지에 인접하고 있다. 쓰레기적환장은 매립쓰레기의 효율적인 운반에 필수이지만 매립 감소와 시민들의 기피로 점차 그 수가 줄고 있다. About 11,170 tons of municipal solid wastes per day were generated in 2005, and 64% of the wastes were recycled as industrial alternative fuel or organic resources. About 10% of wastes were treated by incineration that helps recover district heating energy, and 26% of wastes were reclaimed in landfills. 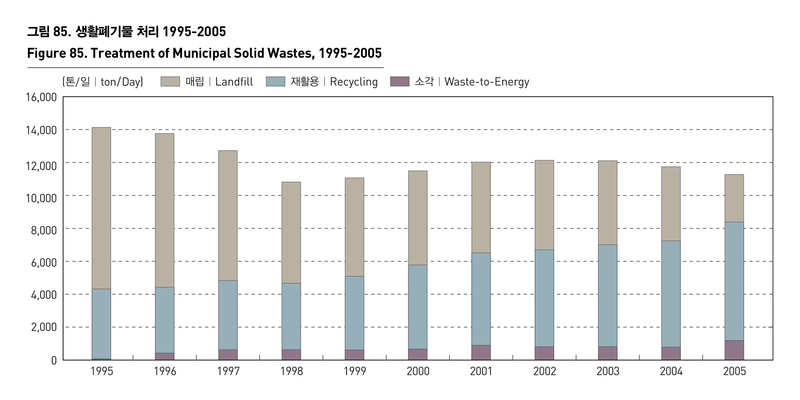 The current trend shows that more and more municipal solid wastes are recycled or incinerated, rather than reclaimed. Utilization of wastes as an alternative resource and their safe treatment require logistics and facilities to support the system. High-quality recycled products are supplied to a market by 15 public municipal recovery facilities, and feed and compost are made out of food wastes by 6 food waste treatment facilities. 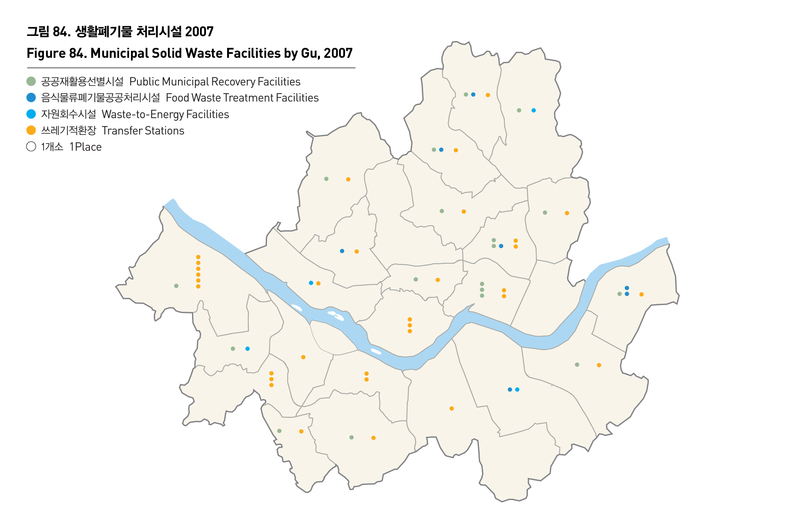 In an effort to help better make use of recovered heat, 4 waste-to-energy facilities are adjacent to the residential complex. Transfer stations are essential for the effective transportation of wastes to be reclaimed, but dwindling reclamation and unwelcoming attitudes of citizens have led to a decrease in the sites.